Charles Wedel of Wisconsin was just one of the soldiers and sailors throughout American history who faithfully served their country. We honor them all on Veteran's Day and on every day of the year. The Manitowoc Shipbuilding Company made submarines during World War II and helped the United States win the war. Charles Wedel served on several of them. Submarines during World War II comprised only two percent of the United States Navy, but managed to sink 55 percent of all Japanese ships sunk by the Armed Forces. Over fifty U.S. submarines were lost and over 3,506 men gave their lives for their country on U.S. submarines. Four of the lost ships – the Tobalo, Golet, Kete and Lagarto – were built in Manitowoc, Wisconsin. 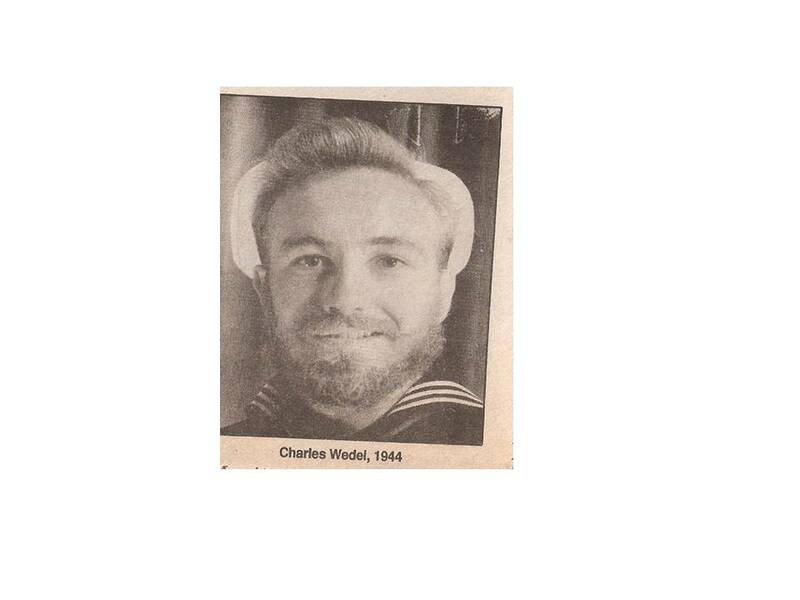 In 1942, after he graduated from Submarine School in New Haven, Connecticut, the Navy sent Charles to Great Lakes Naval Training base in Illinois to go to machinist mate school. The machinist mate’s job was to make sure the engines on the submarine were always in running condition and the auxiliary equipment worked. Charles served on six of the submarines built in Manitowoc for the United States Navy: The U.S.S. Icefish, the U.S.S. Sablefish, the U.S.S. Tautog, the U.S.S.Conger, the U.S.S. Sardia and the U.S.S. Cobia. Each of the 28 submarines built in Manitowoc was named after a fish and any of them carried their own emblems. Generally, each Manitowoc submarine weighed 1,526 tons on top of the water and displaced 2,424 tons of water. Their dimensions were 311 feet by 27 feet by 15 feet. 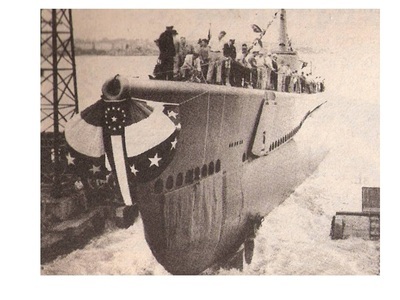 They usually carried 118,000 gallons of fuel, used diesels on the surface and electric engines under water. For weapons they used anti-aircraft guns, a 3-5 inch deck gun, six torpedo tubes in the bow, and four aft. They carried 24 torpedoes on long cruises. But before the Manitowoc submarines could fight the Germans and Japanese, they had to be launched and the topography of the Manitowoc River made this difficult. The Manitowoc River is shallow and too narrow for the traditional “down the ways” launch. In the past, the Manitowoc Shipbuilding Company had managed to overcome this drawback by constantly dredging the river, but they had never before launched a submarine. A submarine sideways launch posed an entirely new set of complications. What about a broadside launch? Traditional ships had been launched broadside into the river, but never a submarine. These were un-traditional times. The workers made a model basin of the Manitowoc River, a twelve foot submarine model, and practiced broadside launching. An unforeseen benefit of the “most undignified” sideways launch soon became apparent. The sideways launch allowed submarines to be built on a level keel, so that torpedo tubes, intake valves and periscopes could be lined up with extraordinary accuracy. This benefit helped make the Manitowoc submarines the best in the American fleet and eventually defeated the German and Japanese Navies. The submarine crews usually consisted of 80-85 men and officers. Charles remembers layers and layers of canned good stacked in the men’s sleeping department that they walked over until they ate their way through the layers. He also recalls that the showers of the enlisted men were filled with potatoes, but since they could take a shower only once a week, they usually ate the potatoes faster than the water could get them. The U.S.S. Icefish served in the Southwest Pacific from the Hawaiian Islands to Southwest Australia. It spent the daylight hours submerged, surfacing only after dark to recharge it its engines and to escape the danger of enemy detection. Charles recalls that the Icefish sank six Japanese ships and did pick up survivors. These survivors were handcuffed to a skid and marched back and forth to the mess and other functions until the Icefish returned to port. Charles and the other Manitowoc submarine crews accumulated an amazing record with just 17 Manitowoc submarines sinking 130 Japanese ships and a total of 486,000 tons of Japanese shipping. The Manitowoc Shipbuilding Company built a total of 28 submarines, the 19th and 20th being cancelled as the sea war wound down. Four of the submarines, the Robalo, Golet, Kete and Lagarto were lost at sea. Many of the submarines remained active after World War II, and the Hardhead and the Jallao remained in the fleet until 1973. During the Falklands War, Argentina used the Lamprey and Macabi for parts. Manitowoc Submarines were "the Finest of All"
After surviving the World War II Submarine Service, Charles Wedel spent twenty more years in the Navy, finally retiring with the rank of Chief Petty Officer, the highest enlisted rank in the Navy. Gali, Fred, Gogats, James, Manitowoc Submarines, Manitowoc County Historical Society, 1995. Nelson, William T., Fresh Water Submarines, Wisconsin Maritime Museum, 1986.